Preheat oven to 375 degrees. Spray a 15x10 inch rimmed baking sheet with water, and then line with parchment paper. In a large bowl, stir together cookie crumbs, sugar, and butter until combined. Press evenly onto the bottom and sides of the prepared baking sheet. Bake, turning halfway, until firm, about 10 minutes. Transfer to a wire rack and allow for 20 minutes. Sprinkle cooled crust with pecans and chocolate. Pour condensed milk over the top, spreading to completely cover (do not drip over the edges). Sprinkle with coconut. 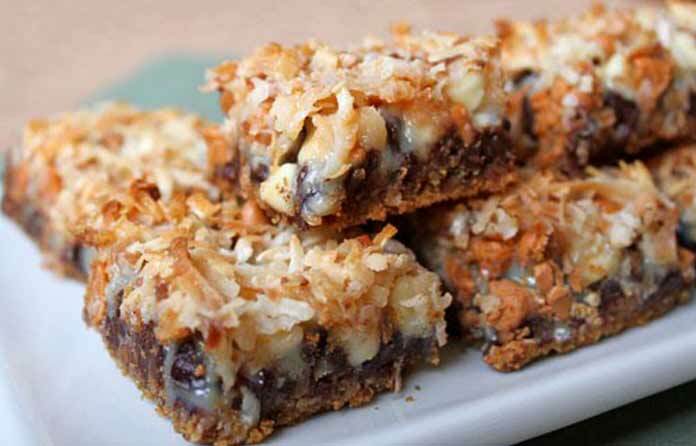 Bake until coconut is toasted, 10 – 15 minutes. Transfer to rack to cool. Then enjoy!